Film school was meant to over-prepare you for the potential challenges that the real world would present. While I still have yet to encounter the majority of these situations, the truth is there were some great exercises that I still borrow on to this day. In the very first core film production class that I ever took, we were required to do an in-camera edit. This meant no software and that things would have to happen chronologically for your project to make sense. Like most projects, things were left fairly open-ended for each of us to make our own mistakes and find a personal style. 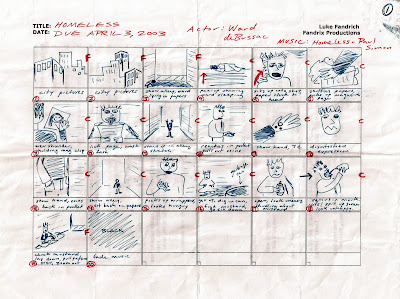 I was reminded of all this when I discovered my original storyboard for that in-camera project, titled Homeless, that I'd drawn up. I always argued that every filmmaker created a homeless guy movie at some point, so I suppose I was eager to get my own out of the way. While the project is alright, it's always been the technique and experience that I gained from it that I like to talk about. 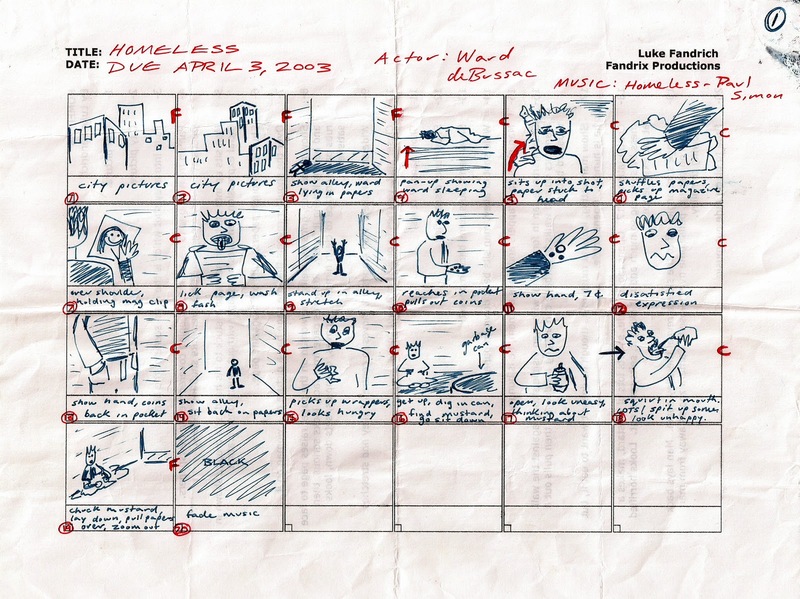 Finding the storyboard just further emphasizes what a great starting point this was for learning how to think through my shots, cuts, and how to compose a complete piece. With the music altered in post and titles added when I uploaded it to YouTube years later, this project is otherwise exactly as the storyboard illustrates. Despite blogging about my film school history on a regular basis, it's cool to actually discover a piece of it and have the story present itself. I don't know what you're talking about. I've never know a film student besides you (current or former)to ever make any movies about the homeless. On a serious note, cool that you found and still have this! You've taken homeless videos to an entirely different arena, Robo Hobo.